Abstract: Large numbers of girls in the developing world are married before age 18, an estimated 100 million girls in the next decade. It is assumed that newly married girls are under pressure to have children early in marriage. However, there is increasing evidence that married adolescent girls have significant levels of unmet need for family planning (FP). 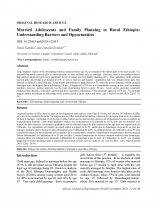 This qualitative study explores married girls‘ knowledge and demand for FP, as well as barriers and support. Qualitative data was obtained from girls who married as children in rural Ethiopia. Respondents demonstrated a high interest in FP, while the power dynamics within arranged marriages were the biggest factor influencing FP use. Disapproval of FP use was considerable among in-laws and community members; however, partner approval was the main determining factor in girls‘ FP use. Some service providers reportedly reinforced this dynamic; some girls reported that they requested confirmation of the husbands‘ approval of FP use. The findings suggest further investment in addressing social norms related to girls‘ status and voice.